It's a cute pattern, one that I've wanted to make, but I didn't have a little boy to knit for before now. I've decided to make a couple of changes, however. 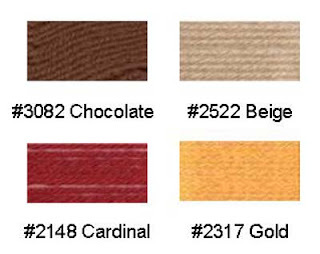 I'm not sure that I like the bright yellow, so it will be beige instead. I can always rip back and change it if the beige doesn't work out. If you look along the edging of the brown sections (omitting the horse), you see some red "piping". I might make it in the yellow color, but I'm not sure yet. I like the bright red of the cowboy as he jumps out at you. When I think of Calgary, I think of things like the Calgary Flames hockey team and the Canadian flag and the color red comes immediately to my mind. The smallest size on the pattern is 4 years, which means that Braydon may have to wait a while until it fits, unless I make a few adjustments. I like to make children's sweaters bigger than they currently need so that they will get full use from them. I'm looking forward to the arrival of the yarn so that I can get started. Hi! 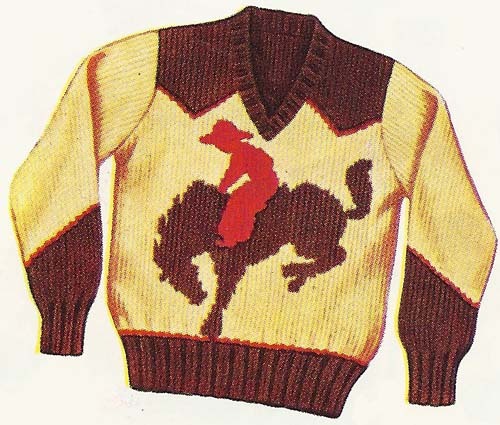 I have been surfing the web for a nice sweater with a horse on it and ran across yours. Could you please tell me where you bought your pattern? I would so love to make one for my little grandson. Thank you. Linda C.